Someone’s having fun at the legislative session. Courtesy of Hannah Hoffman of the SJ. Never heard of this guy, but from the video, he’s an economist – and he’s got a sense of humor. What are the odds? 3/12/2013. Nigel Jaquiss has the story in WW. 3/2/13. Will PERS cuts hold up in court? Kitzhaber wants to cap future COLA increases, which would improve the system’s balance sheet and allow immediate cuts in state contributions. Hannah Hoffman of the SJ has a great discussion of the reasons for the competing views on whether or not the cuts are legal. 2/8/2013. 2). A peer-reviewed and invited 4 unit freshman seminar, which also imposes an enrollment ceiling. My colleague and I always enroll or exceed the maximum to accommodate an invariable waiting list. The student evaluations over many years of these two offerings have been among the strongest in the university in any discipline, both in terms of difficulty and quality. 3). A School of Law J-Term intensive 15-hour 1 unit experimental course in early January that received outstanding student reviews. 4). A 2 unit semester long course on state administrative law this winter and spring that was requested both by students and by School of Law administration. 5). I am instructor of record for a 3 unit semester long course on legislation this winter and spring. In addition to these responsibilities, on an ongoing basis since my retirement from the presidency, I have performed numerous special assignments for my respective deans, two successive university presidents and numerous other university constituencies. It is common knowledge that you have secured volumes of documents (at great expense to the university budget) that would easily have revealed the truth of what I relate. Your continuing carelessness seems attributable to malice, negligence or, regrettably, both. Your lack of attention to the most basic norms of a social scientist is a very poor reflection on your academic integrity and competence. Since you have claimed in the past that you have received academic service credit for your self-styled blog “rants” of this kind, I take the liberty of informing your department and college of this latest example of your behavior. In the article, we paraphrased UO Matters’ Bill Harbaugh saying “former University president Dave Frohnmayer was proposing pay cuts for faculty and Harbaugh found public records showing he had negotiated a big raise for himself with Chancellor Pernsteiner not long before.” Documents provided to the Emerald indicate that while Frohnmayer did get a raise, it was nine months before he asked the faculty to take cuts and months before a serious economic downturn. Additionally, while he was asking staff to take paycuts, Frohnmayer himself took a 7.6 percent paycut, the largest of any administrator. So, if you include all the various pots of salary he was getting, he took a furlough cut from $37,080 a month to $35,575, or about 4% per month, for about three months. Call it about 1% for the year. His furlough plea was for faculty and OA’s to take 5% cuts. I’m also a little confused by Frohnmayer’s dates. He did get one big raise from Pernsteiner in 2008, and that was indeed before the furlough scheme, as his clarification indicates. But his retirement contract also included a very nice raise, however you calculate it. And many other special emoluments as well. I have returned from the road, and am in receipt of your two public records requests. Generally, you have requested President Frohnmayer’s post-presidential agreements and the contract, and other agreements, for incoming President Larivere. For your information, Professor Harbaugh, to my knowledge, neither of these agreements have been finalized. I have a proposal for your consideration: if you would be willing to withdraw these two requests, I would be willing, when I receive these finalized agreements in my office, to forward them to you at no cost. That way, you would not need to make a new public records request; I’d just forward to you when I receive. Would that work? If not, I would be more than happy to process your request and get you an acknowledgement letter! 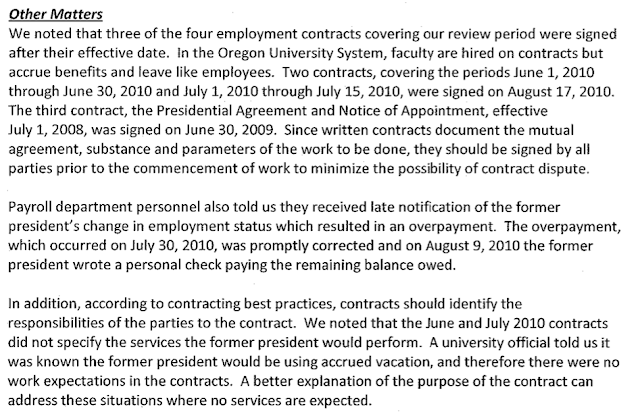 After I raised questions about the legality of this $245,700 emeritus contract UO renegotiated it according to the standard rues, leaving Frohnmayer at $201K with an 0.5 FTE and with fully specified teaching and research responsibilities. Saved UO a good $145K, that did. Contracts here. A number of prominent Oregonians found themselves the subjects of unwanted attention when Kroger raised the curtain two years ago. Among them was former University of Oregon athletic director Mike Bellotti, who received the biggest PERS pension of them all — $41,342 a month. No. 4 on the list was Steve Goldschmidt, who represented the Eugene School District during a 1987 teachers’ strike, whose monthly check was $21,517. Former UO President Dave Frohnmayer came in at No. 5, with $21,207. From what I can tell from the UO salary data, we’re also paying Dave $100,514 a year for co-teaching 2 small classes on “leadership”, with his former special assistant Barbara West – not sure what she gets. Also can’t find any evidence that the Senate Curriculum Committee ever approved his courses. He also teaches a week long one credit pass/fail course in the law school – so he’s a “law professor” when he’s out soliciting clients for HLGR. To top it off he got a lot of deferred compensation from UO, so the PERS number is an underreport of his total state paid retirement income. Contracts here. OK, I’m done with this rant for a while, sorry. Hannah Hoffman of the SJ has a good explanation of how future reductions in payouts from a COLA cap will save the state $400 million a year immediately. From what I can tell this will also mean a large immediate decrease in what the state pays for people in the ORP, which includes many people at UO. And the Persinfo blog explains why they think this will end up in court, with Kitzhaber losing. Follow the PERS tab below for more, or search for the excellent Ted Sickinger stories at the Oregonian.1/30/2013. Ted Sickinger of the Oregonian has been digging into PERS for several years now. Sickinger’s latest report covers reforms that the Legislature might consider, their consequences, and the likelihood they will survive legal challenges. Former UO student Hannah Hoffman covers PERS often in her State Workers Blog for the Salem Statesman-Journal. And the PERSinfo blog is a focal point for those opposing efforts to reduce benefits. One amazing Sickinger story from last year used public records the Oregonian obtained after a lawsuit to examine the tricks Mike Bellotti used to get $500,000 a year from taxpayers. 11/19/2012. Horton’s PERS costs to approach Bellotti’s? Bellotti was able to take advantage of a variety of loopholes – including a well timed divorce and remarriage, plus payments based on Nike earnings for which no contributions were made – to get a budget busting $500,000 a year PERS payoff. Ted Sickinger of the Oregonian did an amazing investigative story on that last year, after the Oregonian sued PERS for the data. The always well informed Hannah Hoffman explains that b-baller coach George Horton won’t get the same special benefits, due to recent federal reforms. Meanwhile all of us in the 57% are paying for Bellotti, and will be for a long time. The state recently announced huge increases in the cost of covering past PERS largess, the Oregonian has covered this in detail, one story here. The prisons’ share is $1.36 billion in the current two-year budget, compared with the $691 million for the entire, seven-school Oregon University System. Not clear if that includes direct state aid to students, a common way of understating higher ed spending. Eckstein, formerly the UO student body president, said it’s too easy for universities to turn to students and require them to make up the shortfall. “What is the university doing as an institution to shoulder the burden of some of the state funding cuts? There were no specific answers on how the university made an effort to reduce costs before turning to tuition increases,” he said. Last year, Lariviere handed out $5 million in special raises to 1,100 faculty members and administrators. “It was an effort to close the gap between where we were and our comparator institutions. We are now at 88 percent of the average,” said Berdahl, who temporarily took over after the state fired Lariviere, in part, because the raises flew in the face of Gov. John Kitzhaber’s directive that state agencies curb personnel costs. Again, this July, the university spent $2.6 million in a 3.5 percent across-the-board salary increase for 900 administrators, mostly middle managers and professional staff. This is a long article covering many contentious issues. It’s good to see the RG taking a skeptical look at UO’s decisions. From the SJ. More in this Oregonian story. The searchable list of all with annual payout > $100,000 is here. Many familiar UO names. Word down at the faculty club is that Frohnmayer will be picking up another $100,000 or so for teaching 3 classes this spring. Two of them are “Leadership” courses in Political Science and the Honors College, co-taught with his former special assistant and Jungian psychologist Barbara West. The other is a 1 credit, week long course in the law school. 11/21/2011: David Thompson of the SJ tweets that the judge just refused to issue an injunction, so basic data on PERS payouts by name and amount will be released to the SJ and the Oregonian today soon, and will presumably be posted online w/in a few days weeks. The top of the list will presumably include many retired UO and OHSU administrators and a state prison doctor or two. 9/20/2011: Here’s the letter from PERS telling current beneficiaries their names and payments will be released publicly on Nov 21. 9/11/2011: Originally the Oregonian just wanted the data on those getting more than $100,000 a year. PERS fought and lost, now everything will be public. Most new PERS retirees get modest amounts – 60% of salary, maybe $30,000. I think the release of this data will actually tone down the rhetoric about what a scam PERS is. But it will certainly embarrass a few retired UO administrators, unless they took the lump sum option and didn’t annuitize it through PERS. This is a watershed event for Oregon transparency and public records access. Congratulations to Ted Sickinger and editor Peter Bhatia of the Oregonian and Dennis Thompson and Bill Church of the Statesman Journal. Also Jeb Bladine of the McMinnville News Register. It is a victory for AG John Kroger, who pushed for public access to these public records, and who announced last week he will run for re-election. It’s a defeat for Pete Shepherd, hired by PERS to try and keep the data secret. Shepherd was the Oregon Deputy AG in charge of public records opinions under AG Hardy Myers. He wrote the 2002 Oregon DOJ opinions refusing to order PERS to provide records, including this and this. Bit of a conflict of interest, eh? As DAG Shepherd also helped UO’s former GC Melinda Grier stall release of many public records. Shepherd now works for Harrang, Long, Gary and Rudnick – the same firm that Dave Frohnmayer was double-dipping at while getting paid full time by UO, as part of his special deal with Pernsteiner. When the data comes out in November Frohnmayer is almost sure to top the list of Tier 1 recipients. The agreement between PERS and the newspapers is here. Shepherd lost big time – PERS agrees to waive all fees associated with releasing the documents and agrees not to go to the legislature for an exemption, etc. According to a 2003 article in the National Tax Journal, privacy for tax filings wasn’t required when Congress enacted the federal income tax in 1861. The article was written by David L. Lenter, a law professor at the University of Virginia; Joel Slemrod, an economics professor at the University of Michigan; and Douglas A. Shackelford, a business professor at the University of North Carolina. It found that from 1861 to 1864, newspapers often published lists of taxpayers and their tax liabilities. In 1870, Congress prohibited the lists’ publication but allowed public inspection of individual returns. There was a backlash by 1894, when Congress prohibited government officials from disclosing any part of an individual or corporate tax return. In the first half of the 20th century, Congress twice required tax disclosure. In 1923 and 1924, individual and corporate taxpayers had to make public their tax payments but not entire returns. Proponents of disclosure said the measure would encourage tax compliance and reduce improper business conduct. “Secrecy is of the greatest aid to corruption,” Robert Howell, a Republican senator from Nebraska, said at the time. What happened to PERS reform? The $58.3 billion state investment fund that supports PERS lost 27 percent of its value during the 2008 market downturn, but grew 19 percent the following year and has since recovered steadily along with the national economy. The system currently is 88 percent funded — meaning there is 88 cents on hand to pay every dollar of benefits promised to every PERS member, both active and retired — and is considered in the top tier of public pension systems in the United States. Meanwhile, haven’t heard anything about the SJ’s lawsuit to get info on how much the largest PERS recipients are getting. PERS hell for ORP members? … Finally, there must be a special hell reserved for my colleagues in the Oregon University System who decided way back in 1996 to accept the OUS’ one-time offer to withdraw from PERS and join the OUS’ “Optional Retirement System”. Money deposited into PERS remained in PERS but future money went into a variety of accounts managed by the system. The system has always been part of the Oregon State Government and paychecks have always come from the State of Oregon. But this doesn’t seem to matter at retirement, as some at PERS have decided that the period between 1996 and retirement, IF YOU ARE IN THE ORP, do not count as state service for the purpose of eligibility for the RHIPA pre-retirement health care subsidy, which is only available to “state” employees based on years of service. For reasons totally opaque to anyone, they are fighting counting the period post-1996 as service to the state. All I can say is that for those of you in that system, watch out for this diamond back. It will hit you at the worst possible time, and it seems to be the result of an bureaucratic and arbitrary decision by someone in that Department at PERS. Hopefully, as I write, this will be straightened out. Retired people shouldn’t have to fight these kinds of battles over healthcare. As he says, “hopefully this will be resolved”, because it is a huge problem for those affected. 10/30/2010: Oregon Attorney General John Kroger and his Government Transparency Counsel Michael Kron have been making slow but steady progress improving Oregon’s public records situation – currently rated F.
Earlier this month they released the 2010 Public Records Manual with some potentially important re-interpretations of the law. Now, in response to a request from Ted Sickinger at the Oregonian, Kroger has decided to require PERS to release basic info on retired state employees getting more than $100,000 a year in PERS benefits – including names, final salary, and monthly benefits. Sickinger’s story is here, the editorial is here. This is serious progress towards Kroger’s stated goal of more transparency in Oregon government. This link includes pretty complete documentation, including the order from AG Kroger and the lawsuit filed in response by PERS. When the PERS list is finally public, who will be at the top with the biggest payout? My guess is former Oregon Attorney General and UO President Dave Frohnmayer, rated as one of the 5 most overpaid university presidents and then given a special lucrative retirement deal by OUS Chancellor George Pernsteiner. What did the PERS board decide to do in response to Kroger’s order that they release the records? They hired an attorney to fight it – Pete Shepherd. Shepherd was the Oregon Deputy AG in charge of public records opinions under AG Hardy Myers. Myers was Frohnmayer’s protege (and Kroger’s predecessor.) Shepherd wrote the 2002 Oregon DOJ opinions refusing to order PERS to provide similar PERS records, including this and this. Bit of a conflict of interest, eh? What firm does Pete Shepherd work for now? Harrang, Long, Gary and Rudnick – same firm that Dave Frohnmayer was double-dipping at while he was still getting paid full time by UO, as part of his special deal with Pernsteiner. UO Vice Provost Russ Tomlin ended that arrangement retroactively on May 15, and Frohnmayer is now on a regular tenure reduction retirement contract. Who will pay the legal fees for PERS and Harrang et al and Pete Shepherd to fight Kroger’s pro transparency, pro good government, pro common sense decision? Oregon taxpayers will pay. PERS is a public agency. Not only will PERS pay Shepherd, PERS also has to pay the DOJ attorneys for their time preparing the public records order that PERS is trying to fight in court. And, when PERS loses this case, taxpayers will have to pay the Oregonian’s legal fees too. Who is in charge of PERS? These people. You can email them here and tell them your thoughts on their decision to spend your money hiding how they are spending your money. Cosy little thing the people who run this state have got going. Thank you John Kroger for taking them on. James Dalton was a senior vice president of Tektronix, Inc., a leading test and measurement technology company. He retired in 2008 after Tektronix was acquired by Danaher Corporation. He was a past member of the board of directors of RadiSys Corporation and the Multnomah County Library Foundation. Dalton received his bachelor’s degree in economics from the University of Massachusetts and his J.D. from Boston College of Law School.